Times are hard when you first start out in Red Dead Redemption 2, and as you thumb through your near-empty wallet you may be wondering how you'll ever afford to buy new weapons or even pay off the bounty on your head. It's definitely hard to make ends meet in the opening section of the story, before you've got access to things such as the Red Dead Redemption 2 fence locations and lock breaker. However, there are always methods available to help you make money fast in Red Dead Redemption 2 - you just need to know the right way to go about it. That's why we put this guide together, to help you gather a stack of cash for Arthur Morgan by outlining a series of legitimate get rich quick schemes you can follow for success. Horses are a good source of business in Red Dead Redemption 2, provided you know how to make the most out of the trade. Any horse you acquire in the game can be brought to a stable to sell off, stow, or upgrade, but the buyer’s price will vary depending on the type of horse you’re trying to flog. If your steed was obtained illegally, for instance, then stablemasters an offer as little as $3 or less, while standard breeds will barely go for much more, even with the right documentation. However, if you manage to find a speedy race horse or beefy shire, the potential profit could be huge, so the added effort of tracking, taming, and bringing them back into town is definitely worth the trouble. Wild horses can be found throughout the open world, but capturing them requires a fair degree of patience and skill, so don’t go running after every bronco you see. It’s no secret that butchers, trappers, and store clerks will pay good money for animal pelts and meat in Red Dead Redemption 2, but there’s a certain talent to making sure each haul brings in the most bang for its buck. For one thing, pelts are harvested in different qualities depending on how the animal was killed. Get a headshot on a rabbit with a small game varmint rifle, for example, and there’s a good chance the pelt will be in perfect condition. Fire half a dozen revolver rounds into a flock of chickens, and it’s probably not even worth the trip back to town. These raw goods will also begin to rot and degrade over time, so the quicker you sell it off, the better price you’ll get. But animals aren’t the only prey on Arthur Morgan’s radar. Find Wanted Posters at Sheriff’s offices in towns, and you’ll be able to start a bounty hunting mission to bring in any active criminals, which can bring in upwards of $100 or more. While Red Dead Redemption 2’s honor system is supposedly unbiased, there’s definitely a lot of hard benefits to being the good cowboy throughout the western frontier. Stores will buy and sell to law abiding citizens at better rates, while staying on the right side of the authorities also means you won’t have to worry about paying off any bounties on your head, which can quickly rack up into the hundreds if you’re not careful, subsequently increasing the number of bounty hunters who’ll be constantly on your tail. Being kind to strangers in Red Dead Redemption 2’s random encounters often leads to long-term dividends, too, as many will repay you with favours and rewards later on in the game. Whenever you’re tempted to rob a store or kill a rando for cash, then, maybe think again. 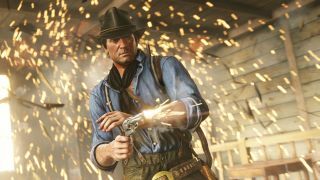 This may seem like outlining the obvious, but there’s no denying that Red Dead Redemption 2’s series of campaign and side missions is an easy, straightforward way to earn money fast and effectively from the very beginning. While not every quest guarantees bucket loads of cash, or any at all for that matter, some represent the biggest rewards available in the game so far. This is particularly the case when you decide to rob a homestead or go out hunting for legendary animals with one of your gang members, as they’ll split the rewards with you or, better yet, let you enjoy the entire thing. Of course, as the campaign escalates in scale and scope, that money pot is only going to get bigger too, so anyone who focuses solely on finishing the story before doing anything else won’t be short of the big bucks. The fence is a specific type of salesman found throughout the west in Red Dead Redemption 2, one who deals mainly in animal goods and hunting tools. The first one you’ll meet is at Emerald Station, east of Valentine, and he’ll pay a good price for any trinkets you come across in the game, such as pocket watches, gold bars, or consumables. You can also bring stolen carriages back to his stable for less legitimate trade, which will net you a sizeable wad of notes per vehicle, and can be robbed from homesteads, towns, or just out on the road. Gambling is about as profitable in Red Dead Redemption 2 as it in real life, in that your chances of making money are acutely dependent on a mix of luck and skill. If you happen to be a dab hand at poker or blackjack, then go ahead and find a table in a nearby saloon to start earning some easy cash, but there are also less complicated games like dominoes and Five Finger Fillet to compete in, with some the larger pots of money well worth the time it takes to participate. Of course, as is the nature of gambling, all your winnings can go down the drain when your overstep your position and lose everything in a single swoop but, hey, there’s always the opportunity to bounce back with a killer hand in the next round. This is more of a tip on saving money than making it, but the thing you need to remember about Red Dead Redemption 2 is that the weapons are as authentic to the time period as possible. In other words, they’re never going to be as powerful as the firearms you’d find in Grand Theft Auto 5, nor as varied, but that’s good news for Arthur Morgan’s wallet. While gun stores do offer a healthy deal of choice for weapon purchases and customisation, it’s not worth splashing huge amounts of cash on them early, especially when several story campaigns will provide you with some of the best weapons in the game for free. Even without those easy pickups, every enemy you fight will drop weaponry that can be equipped, oiled, and upgraded to get yourself a decent gun a much lower price than if you were to buy it from a store. If you spot smoke rising into the sky during your travels across the frontier in Red Dead Redemption 2, chances are that it’s coming from the hearth of a bandit camp. These randomly located hideouts are a good source of loot and money, but you’ll have to deal with the outlaws guarding it all first. Your best bet is to capture them by surprise, and start shooting before they can get a chance to shoot back. With the bandits dead, you’re free to go in and pick up whatever you can find from their corpses, chests, and horses satchels. When totalled together, the haul can be quite a remunerative taking, so don’t pass these opportunities up. Want to make a quick 1000 bucks? Speak to the stranger called Maximo west of Flatneck Station, and you’ll be able to purchase a treasure map off of him for $10. This begins the Red Dead Redemption 2 Jack Hall Gang Treasure Map hunt, a three step process which leads you to uncover two gold bars that can be sold for $500 each at the fence at Emerald Station. It’s an easy path to money making, especially when you read up our Jack Hall treasure hunt guide to complete all the steps without having to crack the (surprisingly difficult) code yourself. It’s also a nice way to explore the map, revealing more of its contents as you travel to each corner of the world during the treasure hunt itself. Bring a horse, and make sure you’ve packed plenty of supplies for the road trip. Want to know how to ride around the West quickly? Here's how to unlock Red Dead Redemption 2 fast travel as quickly as possible.